Rep. Movita Johnson-Harrell addresses reporters. 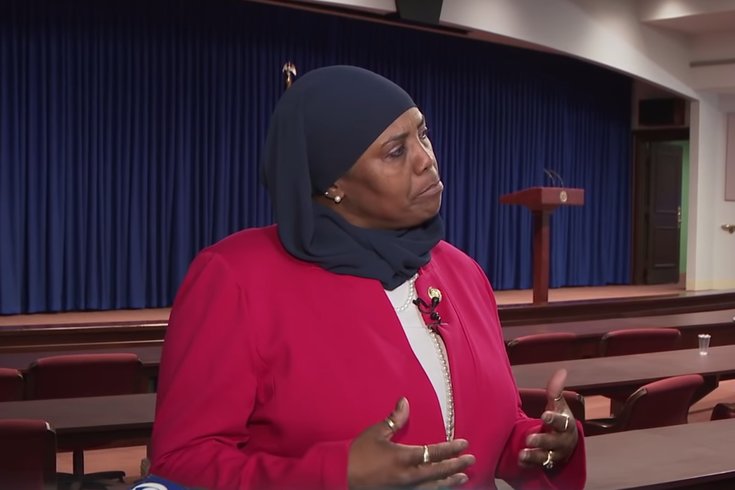 West Philly's newly-elected state representative, Movita Johnson-Harrell, was sworn in earlier this week as the official representative of Pennsylvania’s 190th district. The swearing-in ceremony turned surprisingly acrimonious, after state Rep. Stephanie Borowicz delivered an invocation many, including Johnson-Harrell, found offensive and Islamophobic. The dustup received national attention, turning the microscope on Johnson-Harrell, who was elected to office earlier this month in a special election. The increased attention is likely how Johnson-Harrell found herself on the receiving end of an Islamophobic Facebook message from a real estate agent in Arizona, according to AboutIslam.net. “Please assimilate here and remove your hijab when you are in the people’s house. Your hijab is very offensive to all Americans. We are a JUDEO-CHRISTIAN nation, and have no time for your blubbering complaints. You are in the United States of America. Start acting like it, or return to you (sic) country where Shari’s (sic) is acceptable. The message concluded with flags of Israel and the United States. The Good Life Team AZ does NOT support any hate speech or intolerance from our agents. Consequently, Susan Cohen has been immediately removed from our real estate team. It is our mission to serve ALL members of our community w/ love, respect inclusion & the best quality service.